Louise Benally joined Native delegations speaking today in DC. 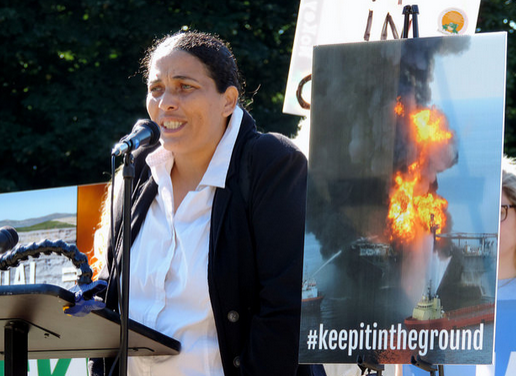 Louise Benally, Dine' of Big Mountain, joined Native American delegations and coalitions in DC today and helped deliver the message to President Obama: It's time to keep our fossil fuels in the ground! 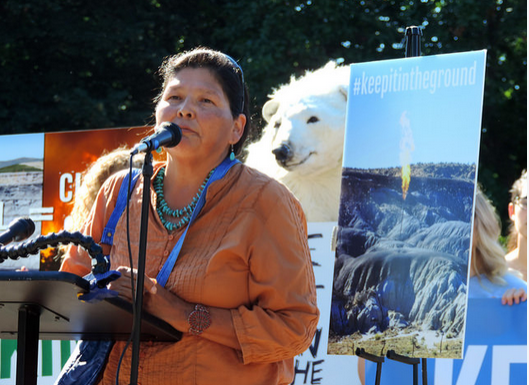 In the Keep it in the Ground campaign, Wild Earth Guardians said, "The time is now to boldly cut carbon pollution and move our nation away from fossil fuels. We can't even begin to make this happen if the President is going to keep stop selling more of our publicly owned coal, oil, and gas. It's time to Keep it in the Ground!" 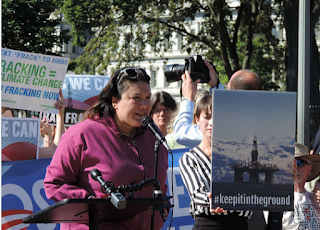 WASHINGTON -- Louise Benally of Big Mountain joined Native American delegations and coalitions here today to tell President Obama to stop leasing lands and oceans for fossils fuels. Benally's message was "Keep it in the Ground." 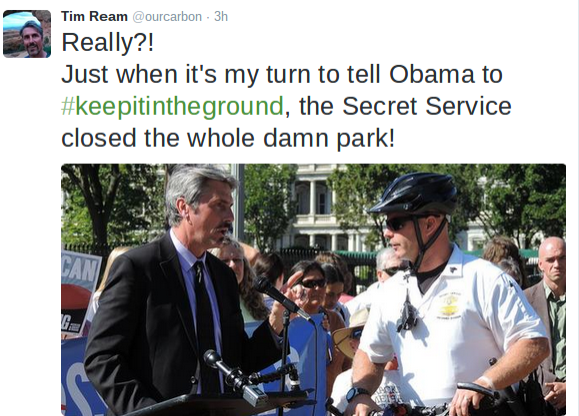 Before President Obama's Secret Service chased Native Americans and their allies away from the White House park, Benally brought the dirty truth of dirty coal in her homeland. “Coal companies like Peabody Energy have been mining federal and tribal coal in and near native communities like mine for decades. The tribal governments allow energy companies to impound peoples’ livestock, which is the only source of income and food for communities impacted by forced removal—a legacy policy initiated by Senator John McCain for Peabody to gain access to coal mining locations. "Peabody mine sites don't have bonds and liners in the waste ponds. Contaminated waters are released in the headwaters after every rain, polluting the little water they leave behind. The Gold King mining disaster is just the most recent example of the kind of devastation that has been happening to the Dine for generations. Before coal, we were devastated by uranium. Now, our families are the targets of a fracking boom on federal lands in places like Chaco Canyon. Dirty energy companies ruin our lands, while the profit goes elsewhere," Benally said. "Environmental concerns are not being addressed properly by agencies that should be accountable. Groundwater tables have dropped by big drops, the greenhouse gases being released into the air are not monitored correctly, and health impacts are not monitored at all. This devastation of our communities is a kind of terrorism made possible by Senators like John McCain, all while President Obama turns a blind eye. These industries are not accountable to the land, the natural world, or the people living here. Their destruction has to stop now.” —Louise Benally, Big Mountain Diné Nation, Indigenous Cultural Concepts, Media Island International. Cherri Foytlin, Bridge the Gulf"said, "I would ask that you put yourself in our place. Over five years have passed since BP's broken promises spewed as easily from their tongues as the oil did from their broken pipe. To this day our peoples and ecosystems suffer from BP's brutal, callous, and lasting assault. Five years, and our dolphins still die, our turtles still die, our oysters still die, our marshes still die, our people still die. "BP is a corporate serial killer. BP is a terrorist organization. Yet they not only remain free to continue their patterns of destruction, they are subsidized by our government to do it. How many more graves will there be, before justice is truly served in the Gulf Coast? That is the only question we have now." Princess Daazhraii Johnson of Resisting Environmental Destruction on Indigenous Lands (REDOIL) delivered a powerful message from Alaska. "We are in climate crisis in Alaska, and advancing energy extraction within our ancestral territories would seriously exacerbate climate change and threaten our ability to survive in the Arctic. Climate Change is upsetting the delicate balance in many ecosystems. There is an urgency to take action now. 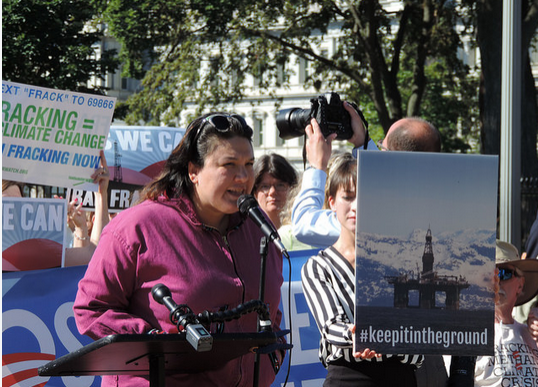 "The President was in Alaska, and saw for himself the consequences of climate change. Indigenous peoples of the North implore him to take effective action now to address the issue while we still can. If the U.S. is serious about Climate Change, rescind the Shell permits to drill in the Chukchi Sea, and permanently protect the Arctic National Wildlife Refuge. We must keep the remaining fossil fuels in the ground and continue towards a just transition to alternative energies. We do not have the luxury of time. We can implement clean energy systems in the U.S. now." 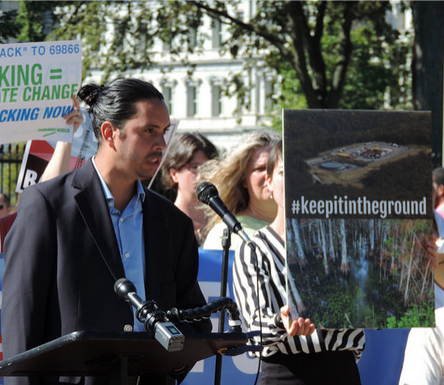 WASHINGTON — A coalition of more than 400 organizations and leaders will deliver a historic letter to the White House on Tuesday calling on President Obama to stop new federal fossil fuel leasing on public lands and oceans in the United States. The letter argues that, by keeping publicly owned fossil fuels that haven’t already been leased to industry in the ground, President Obama can keep nearly half of the potential emissions from all remaining U.S. fossil fuels, up to 450 billion tons, from the global pool of potential carbon pollution. More than 67 million acres of public land and ocean are already leased to the fossil fuel industry. That represents an area 55 times larger than Grand Canyon National Park and contains up to 43 billion tons of potential carbon pollution. Deeming unleased oil, gas and coal “unburnable” would accomplish more in the global fight against climate catastrophe than any other single climate action taken by the Obama administration. Hundreds of prominent organizations and leaders from Alaska to Florida signed the letter, among them indigenous leaders, labor unions, scientists, religious leaders, public interest groups and climate activists, including: Bill McKibben, Winona LaDuke, Robert F. Kennedy Jr., Dr. Noam Chomsky, Dr. Michael Mann, Tim DeChristopher, Dr. Stuart Pimm, Dr. Michael Soule, United Auto Workers Union, Unitarian Universalist Association, Physicians for Social Responsibility, Protect Our Winters, 350.org, Center for Biological Diversity, Environment America, Friends of the Earth, Food & Water Watch, Indigenous Environmental Network, Oil Change International, Greenpeace, Rainforest Action Network, REDOIL, Sierra Club, Waterkeeper Alliance, WildEarth Guardians and hundreds of others. The American public owns nearly 650 million acres of federal public land, and more than 1.7 billion acres of Outer Continental Shelf — and the fossil fuels beneath them. This includes federal public lands like national parks, national forests and wildlife refuges that make up about a third of the U.S. land area — and oceans like Alaska’s Chukchi Sea, the Gulf of Mexico and the eastern seaboard. These places and fossil fuels are held in trust for the public by the federal government; federal fossil fuel leasing is administered by the Department of the Interior. Download a copy of the signed letter here. Climate change poses unprecedented threats to human civilization. During your term you’ve given voice to the urgency of those threats and have taken important steps to address greenhouse gas pollution. But these efforts, and the efforts of other leaders in the United States and abroad, haven’t been enough to prevent greenhouse gas emissions from reaching record levels and accelerating the world toward climate catastrophe. International initiatives to tackle carbon emissions are undermined by the continued expansion of fossil fuel development across the globe. Here at home, the longstanding U.S. policy of leasing federal public lands and oceans to corporations for coal, oil and gas extraction must end. As the world focuses on climate change in advance of negotiations in Paris this winter, we urge you to demonstrate strong climate leadership by stopping new leasing of our publicly owned fossil fuels. Federal leasing of publicly owned fossil fuels contributes significantly to U.S. and global greenhouse gas emissions. Over the past decade, the burning of fossil fuels from federal leasing has resulted in nearly a quarter of all U.S. energy-related emissions and nearly 4 percent of global emissions. Despite this pollution and the looming climate threat, your administration continues to lease publicly owned fossil fuels, endangering the health and welfare of communities and the planet. Under existing federal laws, including the Mineral Leasing Act, Outer Continental Shelf Lands Act, Federal Land Policy and Management Act, and Surface Mining Control and Reclamation Act, you have clear authority to stop new leases. With the stroke of a pen, you could take the bold action needed to stop new federal leasing of fossil fuels, and to keep those remaining fossil fuels — our publicly owned fossil fuels — safely in the ground. The cost of continuing federal fossil fuel leasing to our land, climate and communities is too high. The science is clear that, to maintain a good chance of avoiding catastrophic levels of warming, the world must keep the vast majority of its remaining fossil fuels in the ground. Federal fossil fuels — those that you control — are the natural place to begin. Each new federal fossil fuel lease opens new deposits for development that should be deemed unburnable. By placing those deposits off limits, stopping new leasing would help align your administration's energy policy with a safer climate future and global carbon budgets. With so many of our federal public lands and waters already leased, it is time to stop selling even more of these public fossil fuels to be extracted and burned. Up to 450 billion tons of potential greenhouse gas pollution could be immediately removed from the global pool of potential climate pollution by stopping new federal leasing. To address the climate crisis, our national energy policy must curb fossil fuel demand and production. As the world’s largest historic cumulative polluter and a global economic leader, the imperative for U.S. climate leadership is paramount. As the climate negotiations in Paris approach, a U.S. commitment to stop new fossil fuel leasing would set an important precedent in the global fight to keep fossil fuels in the ground. Federal public lands and waters — such as our national parks, monuments, forests, wildlife refuges and oceans — are cherished resources for us all. They embody deep and diverse cultural values and provide clean air and water, recreation and solitude, and refuge for endangered wildlife. Yet your administration alone has leased nearly 15 million acres of public land and 21 million acres of ocean for fossil fuel industrialization. In total more than 67 million acres — an area 55 times larger than Grand Canyon National Park — is already leased to the fossil fuel industry. 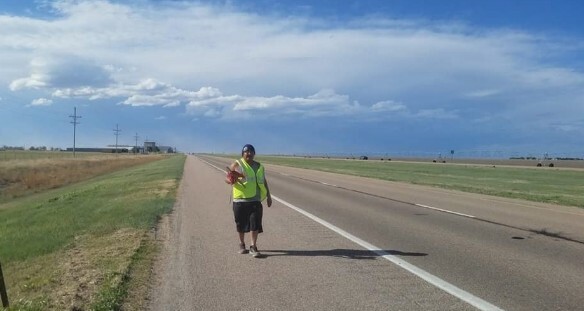 Four Corners-area fracking and coal mining pollution. Stopping federal fossil fuel leasing also makes economic sense. According to the federal government’s own estimates, the burning of our publicly owned fossil fuels costs society between $16 billion and $155 billion in climate-related damages per year. As you’ve noted, the unparalleled potential for clean energy jobs in the renewable energy and efficiency sectors are the path to a just transition for a clean energy future. For these reasons we, the undersigned, call on you to use your existing executive authority to stop new leasing of our remaining, publicly owned fossil fuels. We call on you to make our nation the first to commit to keeping all of its remaining, unleased public fossil fuels in the ground, thereby challenging other nations to do the same. Such leadership is necessary to ensure a livable climate and planet for both present and future generations.